English Democrats candidate Matt O'Connor says he has halted his campaign to be London mayor. Mr O'Connor told BBC London he fell out with the party leadership over campaign funding and tactics. But his name will still appear on ballot papers as they have been printed - and many postal votes have already been cast in the 1 May contest. 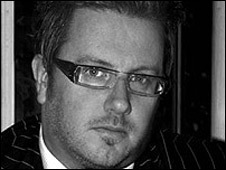 Mr O'Connor is best known as the founder and spokesman for the campaigning group Fathers 4 Justice. Explaining his decision to stop campaigning with less than a week to go before polling day, Mr O'Connor said he had been unhappy with the lack of coverage he was getting from the media. He told presenter Vanessa Feltz: "We've just had St George's Day and you would just think the one thing a party about England would own would be St George's Day. "But I don't think they got any publicity at all and I was effectively sidelined. I think they thought I was going to take over the party or something." The marketing consultant was approached by the English Democrats to run for them in the mayoral race after journalist Garry Bushell pulled out. He said he had been flattered to be asked but added: "It's an awful situation to be in, but probably with the benefit of hindsight I probably should not have stood for them. I should have checked them out a bit more." Mr O'Connor's election agent and English Democrats' London regional chairman, Steve Uncles, said the candidate had been "frustrated" by the lack of coverage. But, he added, Mr O'Connor's name would still be on the ballot paper as the deadline for nominations had passed. "The only way he can actually resign is if he dies," said Mr Uncles. Mr Uncles said the party had "never expected to get him elected" and would now concentrate its efforts on the London Assembly elections, where it hoped to achieve the 5% of the vote needed to gain a seat. The party says it paid the £10,000 deposit Mr O'Connor needed to enter the race.